Completing the circuit with the sport genre, TCX has one more present to gift this season, though you can't unwrap it until Spring! 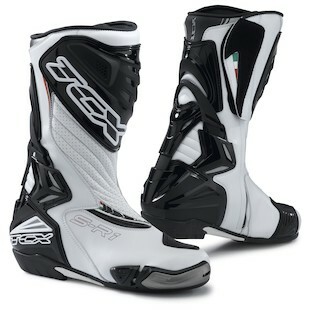 Positioned between the S-Race and the S-Zero, the TCX S-R1 Boots work best as a light track day solution or hard-core sport bike choice. Leading with protection, the S-R1 features the TCX Metatarsal Control System (or MCS). This limits the extremes to which your ankle can flex while maintaining a free-range of safe motion. Armor reinforcements appear at the heel, toe, shin, achilles, ankle, and instep as well as shifter pad and an alloy toe slider. Steel mesh intakes over the ankles force air through the boot keeping you cool over the scorching asphalt. In addition, the front is riddled with perforation as well as some extra padding for comfort. 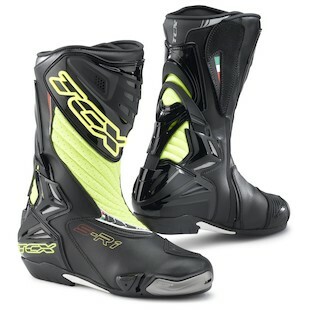 The TCX S-R1 come in black, white/black, a high contrast black and fluorescent yellow.